Regular maintenance of the Girth gear is an area of the mill’s drive train that can be neglected by a maintenance department, albeit quite unintentionally. This oversight can result in failure or excessive wear, or both, which causes unplanned, costly mill down time. Due to high capital costs, holding a replacement girth gear is not always an option for many sites, hence the importance of the correct maintenance strategy. 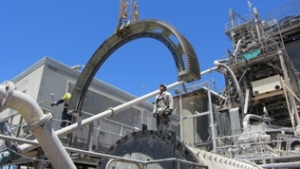 FPMS can provide you with all the necessary inspections, repairs and installation services. The Girth gear requires a frequent inspection program to ensure that any damage that may occur is found and attended to before it becomes irreparable. Should damage be left unchecked, this could result in excessive down time due to the long lead time for replacement items. Fixed Plant Maintenance Solutions (FPMS) can carry out routine inspections and recommend Preventative Maintenance (PM) schedules, along with recommending appropriate lubricants, installations and misalignment adjustments, all of which will ensure much greater reliability from your equipment. DO YOU KNOW YOUR GIRTH GEAR’S OPERATIONAL LIMITS? Some may consider the open gear drive as an ‘agricultural piece of equipment’ that requires little to no up-keep. However, operation limits for any Girth gear can be quite small, for instance, a girth gear with a diameter of around 7 metres needs to have an axial runout of no greater than 0.35mm. And depending on the face width, it must be running with a temperature differential across the pinion contact surface in the area of no more that 6 to 8 degrees. That leaves very little room for variations… or errors. To make sure your girth gear is operating optimally or for further information about alignment set ups and adjustments or installations, please contact FPMS at brentd@fixedplantms.com.au. Because FPMS is solely independent of any of the large gearing manufacturers, we can also provide an unbiased opinion on the recommendation of suppliers for equipment replacement or the supply of new equipment.